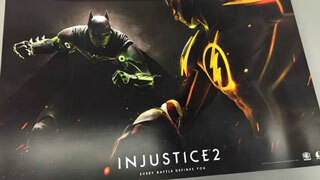 A leaked photo of a GameStop promotional poster has apparently confirmed Injustice 2. It's the week before E3, and leaks and rumors are flying all over. The latest one is Injustice 2. The folks over at Polygon received a photo of a promotional poster that was apparently sent out to GameStop stores or those who pre-order the soon-to-be announced title. THey also received a copy of a letter sent to GameStop managers detailing the promotion. The poster (pictured above) features Batman taking on The Flash, along with the slogan, "Every battle defines you." That's pretty compelling, but what pushes this one over the edge to basically confirmed was a tweet from Ed Boon, the creative director at Netherrealm, the studio behind Injustice. Apparently GameStop is off the party list. Although Warner isn't holding a press conference at E3 this year, you can bet that we'll see Injustice 2 at either Sony or Microsoft's event next week.